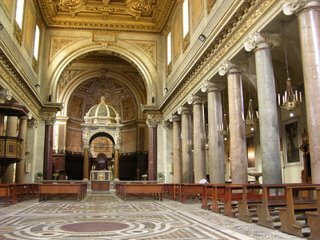 The Station, at Rome, is in the church of St. Chrysogonus, one of the most celebrated martyrs of the Church of Rome. His name is inserted in the Canon of the Mass. The church was probably built in the 4th century under Pope Sylvester I. Station is at St. Chrysogonus’ Church in Trastevere across the Tiber. This was the titular church of Pope Leo XIII when he was still a Cardinal. St. Chrysogonus is one of the saints invoked in the Canon of the Mass. Until Maunday Thursday, in masses of the season, the Psalm Judica me Psalm 42 is omitted as well as the Gloria Patri after the Introit and the Lavabo. In the Gospel, grace is compared to water, because, like water, it extinguishes the fire of the passions, refreshes the spirit, quenches the thirst of immoderate desires, and gives life and growth to the beauteous flowers of virtue. Saint Chrysogonus, a Roman military officer, is one of those martyrs named in the Roman Canon at Mass. Nothing is known about him today, except that he probably suffered at Aquileia in Northern Italy around the year 304. He was much venerated by the Greeks and later also in Rome. According to the Passio of Saint Anastasia, Saint Chrysogonus was a Roman official who became her spiritual father. When he was imprisoned under Diocletian (284-305), he continued to guide her spiritually by letter until he was summoned by the Emperor at Aquileia, condemned, and beheaded. His body was cast into the sea, whence it was recovered and buried by the priest Saint Zoilus, who lived close by in the house of Saints Agape, Chionia, and Irene. In 1907, a subterranean church, twenty feet below the present street level, was discovered; the walls still retain traces of early frescoes. Possibly this was the Roman house of Chrysogonus. The present church was built in such a way that its left aisle corresponds to the left aisle of the old church. The first references to a church here go back to the fifth century and, in the Roman Councils of 499 and 595, the signatures of three priests from the titulus Chrysogoni are found. It is, therefore, one of the original twenty-five parishes of Rome. Gregory III (731-741) restored the antique basilica and constructed an adjoining monastery, dedicated to Saints Stephen, Lawrence, and Chrysogonus, to house the Greek monks who had fled Constantinople following the Iconoclast Controversy. The present church was built over the old one in the twelfth century and it was restored again in the seventeenth and nineteenth centuries. To the right of the church is a Romanesque campanile, built in 1124 and restored fairly recently. It is one of the few in Rome with a dome and spire. Note the lower basilica, which is reached by a spiral staircase from the sacristy. Look especially for the apse of the old church and the remains of the martyr’s shrine in the middle of the apse wall. On either side of the old apse are rooms known as pastophoria, service rooms uncommon in the West but normal in Eastern churches. The one of the right-hand side is thought to have been used as a diaconium, which functioned roughly as a sacristy, and the other as a protesis, where holy relics were kept. The relics here include the head and arm of Saint Chrysogonus and the arm of Saint James the Great (under the main altar), plus those of Blessed Anna Maria Taigi (1769-1837), a Trinitarian tertiary who lived in the building next to the church (see her chapel to the left of the main altar). Also under the main altar are the relics of San Giovanni di Matha, confessor, and San Michele dei Santi, confessor. San Crisogono was formally erected into a station by Gregory the Great, and has been administered by the Order of the Most Holy Trinity for the Ransom of Captives, more commonly known as the Trinitarians, since 1847. Location: In Trastevere at the Piazza Sidney Sonnino, at the intersection of the Lungotevere-Raffaelo Sanzio and Ponte Garibaldi.